At the recently held Miyazawa Model Exhibition, Medicom was present to unveil new products. 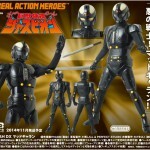 Of note, we have a new RAH DX Kamen Rider Black 2.0 on the way. The high end Century King will be going up for pre order this January and will be shipped sometime in August. The cost of the figure will be a steep 22,680 yen but the time gap between release should offer plenty of time to save up. 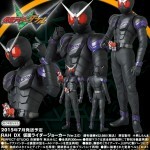 Medicom Reveals RAH DX Kamen Rider Joker 2.0! The fan favrioute Kamen Rider Joker returns to Medicom’s high end RAH DX line with figure that utilizes the new body from Cyclone Joker 2.0! 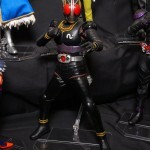 RAH DX Kamen Rider Joker 2.0 like all recent RAH DX releases will only be avalaible online via Medicom’s Premium Club site even more bad news is that the figure is quite expensive compared to a Figuarts, retailing for 22,680 yen before middle man fees and shipping. But on the positive side, the figure will be going up for pre order October 24th and won’t see release till May 2015, offering plenty of time to save. Continuing through the run through Metal Heroes, Medicom has announced that they will be releasing a figure of Mad Gallan from Kyojuu Tokusou Juspion. Released as an online exclusive via Medicom Premium Club Store , Mad Gallan comes with an alternate light up eyes head and a sword retailing for a whopping 22,520 yen. You can expect to see this figure in October 2014.